Every year, I mix it up and try some different flavor combos in my salsa and I hit the JACKPOT on this one, no joke. 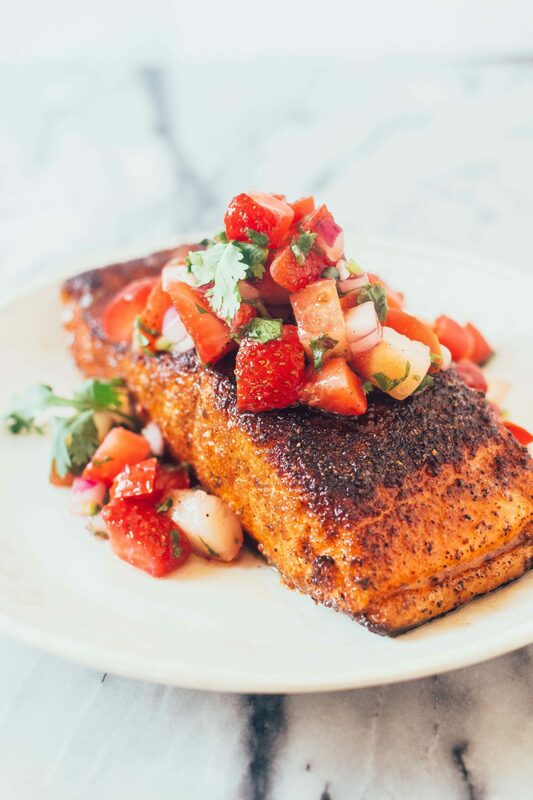 The flavor of the peach and strawberry is not only great in salsa form but also enhances the smoky, sweet flavor of the salmon. I’ve used some variation of this blackening mix for years and I’m proud of myself to have finally documented it. It’s basically all the spice cabinet basics thrown together with some coconut sugar for that extra browning power. Crispiest skin AND flesh happening here. Let me know if you try it! Mix all the spices together in a small bowl. Coat the salmon liberally on all sides. Set it aside to rest 10 minutes or until the outside turns sticky. Heat a wide stainless steel or ceramic skillet over medium heat (I don’t recommend cast iron because it can pull the seasoning off). Place the salmon down flesh side first. After 2 minutes, gently shake the pan to loosen the salmon. Do not pry up with a spatula or the seasoning can come off. Continue to sear until fairly dark (nearly black), about another 2 minutes. Flip the salmon with a fish spatula and sear 2-3 minutes on the skin side until the skin is dark and crispy. Rest for 5 minutes before serving. Chop the peaches, strawberries, and tomatoes into small 1″-ish pieces. Add them to the bowl with the cilantro and toss everything together. Allow the salsa to rest about 10 minutes at this point before serving for best flavor.